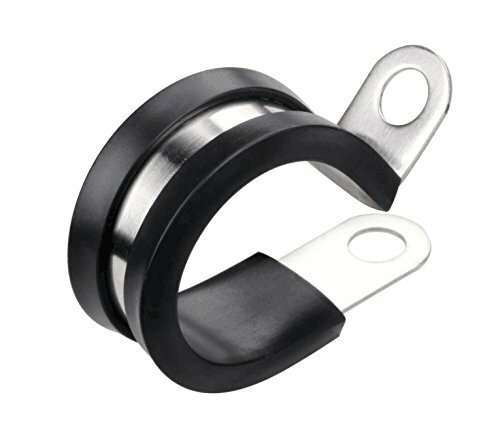 Lokman Premium 304 Rubber Cushioned Stainless Steel Cable Clamps. Gives You a 5 stars reliable smart tools improvement. Clamp inside diameter: 1 inch. Fit for 1 inch (outside diameter) wiring, lines, pipes hoses or cables to a panel or frame application. Clamp width (include the rubber cushioned): 15mm. Look up the OUTSIDE DIAMETER of the type of pipe you wish to clamp, and then select the appropriate clamp based on that. Varies sizes and Compatible Stainless steel bolts and nuts are are available on LOKMAN Amazon on-line shop. NOTE: Larger quantity cable clamps buyer can apply more favorable discount. Details and conditions please kindly contact us via email. VARIES sizes CABLE CLAMPS and Compatible Stainless steel bolts and nuts are available on LOKMAN Amazon on-line shop. SIZE- Cable clamp screw hole diameter: 6.5mm, fit for 6M( 1/4 inch) screw bolt to through them. Cable clamp inside diameter 1 inch. Fit for 1 inch (outside diameter) wiring, lines,hoses or cables to a panel or frame application. If you have any questions about this product by LOKMAN, contact us by completing and submitting the form below. If you are looking for a specif part number, please include it with your message.